I have tried each flavor and there are some definite contradictions in each bag. The strawberry and green apple flavors were literally non-existent until I had swallowed the candy. What was really odd is that when I sniffed the open bags, the smell of strawberry and apple was very strong. However, these two flavors only appeared as an aftertaste and not a very strong one. The mango flavor was up front and alive in my mouth, it was an honest and truly good flavor and yet it hardly had any mango aroma in the bag. The black licorice had a good strong anise aroma in the bag but the flavor was not what I expected. The first flavor that hits you (and hits hard) is molasses. The traditional black licorice flavor (anise) comes out only after youâ€™re done chewing. Only then is it at its strongest, so sorry but youâ€™ve got to wait till you swallow to get it. I know there are die hard black licorice fans out there and Iâ€™m not sure if youâ€™re going to like this at all. As far as the texture goes, itâ€™s good and chewy like you would expect from any licorice, especially pieces this thick. Itâ€™s a soft eating licorice but itâ€™s also a stick to your teeth licorice. On the down side, thereâ€™s almost a greasy feeling to it that I found unappealing. Itâ€™s honestly a strange part of the texture that I didnâ€™t expect and didnâ€™t really like either. 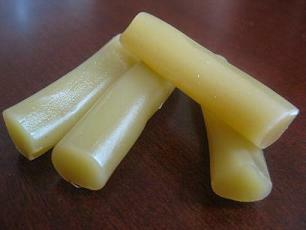 The upside to all this for me is the fact that Darrell Lea makes the licorice all natural. That means all natural colors and flavors (although the spinach they used to color the green apple makes it more of an olive green rather than granny smith apple green). I have a son with ADD and he has a sensitivity to artificial food colorings (to be discussed in a future post) so Iâ€™m always looking for candy made with natural colorings. I have tried these several times and agree with your review 100%! I cannot find Mango, but will keep an eye out for it. Bought a bag of mango. Tastes like beta carotene, not mango, it’s gooey, STICKS TO TEETH like crazy (no thanks modified food starch!). The bag I had was quite hard and chewy. This box of panda that has been sitting here a few months in cold weather is almost just as hard, otherwise in my impression is panda’s (the only other brand i’ve tried) is smaller, matte colored, softer, & easier to eat… still sticks to teeth but not the modified food starch way.